​within through stories and myths. Have you, like me, always been fascinated with stories, fairy tales, and myths? ​Did you know that they offer instructions on how to walk on your path? Do you know that they lead you within to your own knowing? can inform you about yourself and how you function in your life? - Deal with abuse, addiction and loss of oneself. - Understand and follow your intuition. - Sort through the beliefs that need to die and the ones that need to live. - Stand up for yourselves, speak up and set boundaries. - Nurture and care for your creative life. - Be in a joyous relationship with your body. ​teach and lead circles based on her book. I will guide you through inquiries, rituals, and discussions based on the stories and characters told in the second chapter of the book. Each week, you will get a deeper understanding of yourself and the Wild Woman within. These sessions will be held on Tuesday, April 4, 11, and 18 from 7-9pm. 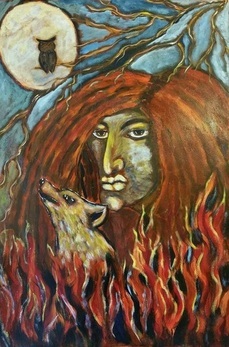 ​The Wild Woman Archetype is a universal idea that existed since time before time and it's bigger than human beings. This archetype is divine and contains all aspects of a whole. She comes to visit human beings mostly through dreams. She is not human so when she visits, she can look like a human, a tree, an animal, or anything else that she chooses. "Wild Woman has no name, for she is so vast. But, since Wild Woman engenders every important facet of womanliness, here on earth she is names many names, not only in order to peer into the myriad aspects of her nature but also to hold on to her. Because in the beginning of retrieving our relationship with her she can turn to smoke in an instant, by naming her we create for her a territory of thought and feeling within us. Then she will come, and if valued, she will stay." When you hear Wild Woman and feel a stirring in your womb or a deep sense of recognition, you know who she is and where she resides even if you don't have words for it. You most probably long for her and her teachings. 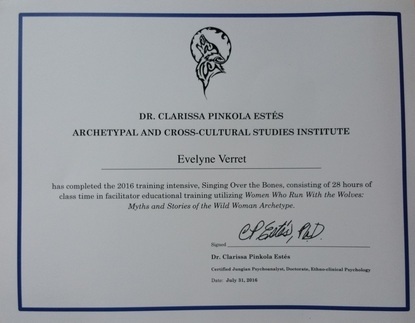 Now is the time to deepen your knowledge of your inner wild woman by joining this circle. I have this vision of women around the world being free to be who they are, to share their gifts and be in love with their life... are you one of them?? ?